New version 1.0 20181201 (as returned by the kernel 3.14). Would like to check if it is possible to run Volumio and routing to the Tone Board DAC and not to use any of the sound card chip on board the VIM2. How do I load Roon Bridge into VIM2? Currently the binaries is based on ARM, can we use the same shell script for installation? Any way to disable the wifi / bluetooth / AML M8AUDIO etc drivers ? и результат попытки установки пакетов. Need to get 81.5 MB of archives. Извините не знаю как под спойлер убрать. Я попробую проверить у себя на выходных. Подключился по wifi и отключил lan. Теперь с пакетами проблем нет. is there any easy way to add Myvolumio to your existing build or new build is needed? Clarify what “myVolumio” . Is it an add-on or some customization ? 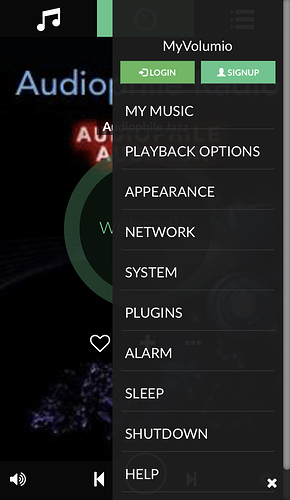 Its a new cloud service from Volumio (https://volumio.org/myvolumio/) that adds premium services to the local player (Tidal and Qobuz). Myvolumio menu appear in the standard menu when you install volumio on the sbc. From this menu you can log in to the volumio cloud and get cloud backup, cloud streaming, Tidal, etc. If this functionality is not an additional setting (which can be performed\added in the current system), then the image needs to be rebuilt. But this question can only be answered by the developer of this function, how it is implemented. Ok. I think it’s clear. New build with the latest source from volumio’s GitHub is needed. Actually, you will not be able to build a myVolumio-supported version locally. It can only be done when the image is built on the volumio build server. The build scripts also need to be slightly modified, but afterwards these modifications will allow you to continue to build locally. It just won’t have myVolumio. In case there is enough interest, we might build a specific Volumio version this year for people who do not care about loosing the android tv box functions and use the volumio-builtin “disk copy” to copy to emmc. It would be a community supported version with myVolumio and have support up to DSD256 for capable usb audio devices. When sufficient hw support is available, we might be using a mainline kernel. Everything you need has long been in the main core.